We were National Trust and English Heritage members long before we had the kids because it was a way of supporting our historic buildings and landscapes, experiencing beautiful gardens and experiencing history and art on many many days out all over the country. Once we had the boys though our memberships provided us with something extra - outdoor spaces where our children could roll in the grass without rolling in dog dirt. One of Ollie's first words was 'poo' from the unfortunately necessity of my constant 'mind the poo' as we walked the paths, parks and woods locally. It seems to be an epidemic at the moment and it makes me really sad and angry that I can't relax while the kids use of the many great local playing fields and outdoor spaces because of the thoughtlessness of others. 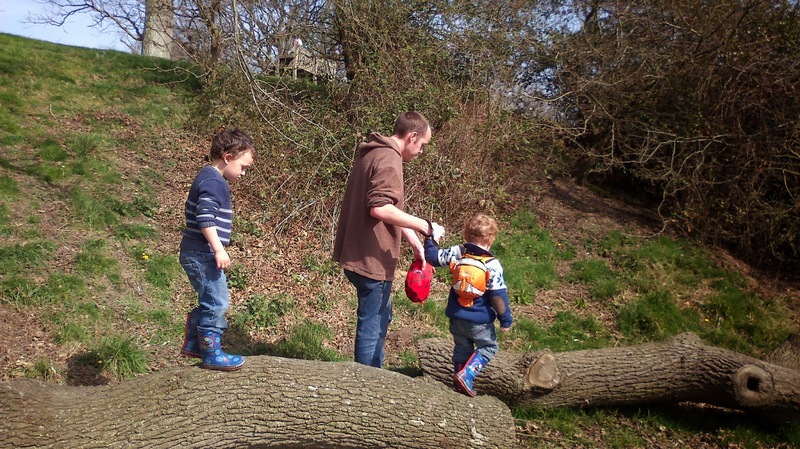 Paying out annually for memberships to the National Trust and English Heritage has therefore provided countless 'clean dirt' experiences for the kids as they climb into hollow trees, balance on logs and crawl through meadows. 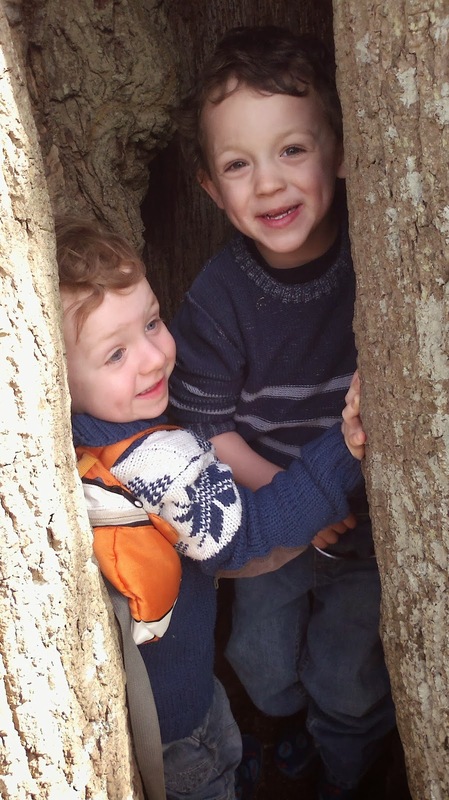 These physical play opportunities are the best way for children to develop their gross motor skills and learn balance and coordination, as well as all the other opportunities for learning that they present. On Sunday we visited Bodium Castle, and instead of charging straight up to the Castle itself, this time we took a stroll along the country lane running near by it. 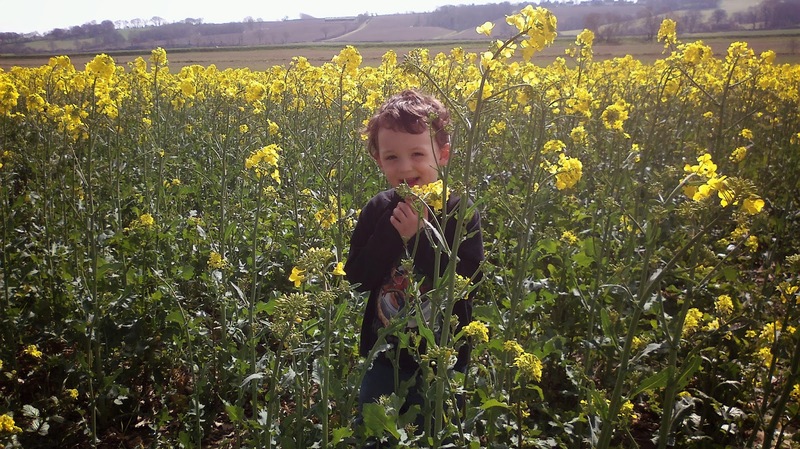 As part of our seasonal 'farm to fork' series of experiences it fitted in really well, since we could show the boys the oil seed growing in the fields, smell the flowers, watch the bees and butterflies and watch the tiny black pollen beetles hiding in the crop. We talked about how the pollen is blown by the wind and carried by insects between the flowers and this helps the flowers to make seeds which will be crushed to produce cooking oil. 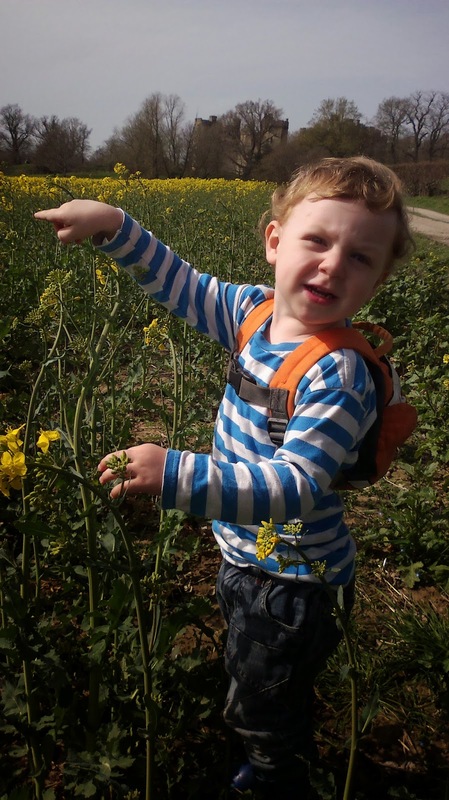 Toby was fascinated with all the insect life living amongst the crop, spending a long time watching bumble bees looking for likely nest holes in the field margins. His favourite game was picking up stones off the traffic-free lane and throwing them into the puddles in the pot holes, another good set of activities for improving hand eye coordination and gross motor skills. 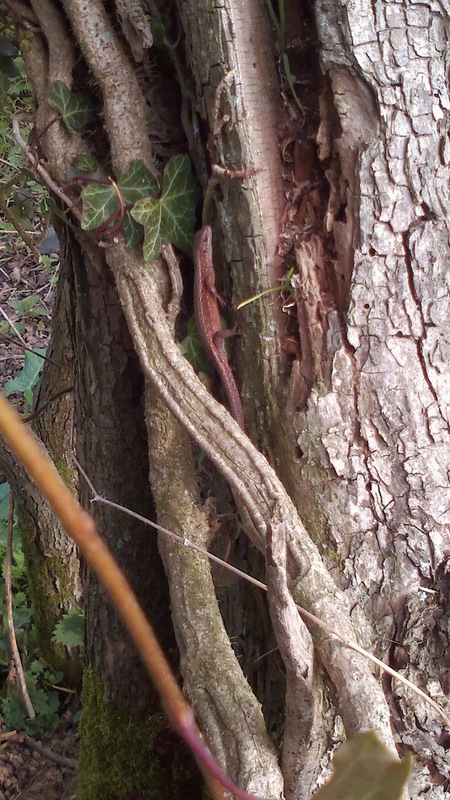 We were all very excited to see the lizard in the hedge that stayed still for ages so we got a really good look at it. This triggered a discussion with Ollie about how some animals like lizards and snakes are 'cold blooded' and use the heat from the sun to warm themselves up so they can move quickly. We also took photos of butterflies so Ollie could use his book later on to find out which types they were. Every so often we would stop and listen to the birds, watch the buzzards circle overhead, try to spot the pheasants making a commotion somewhere out of sight and look at the movement of the strange looking hoverflies with long proboscis stretched out from their heads like funny looking bees sticking their tongues out. 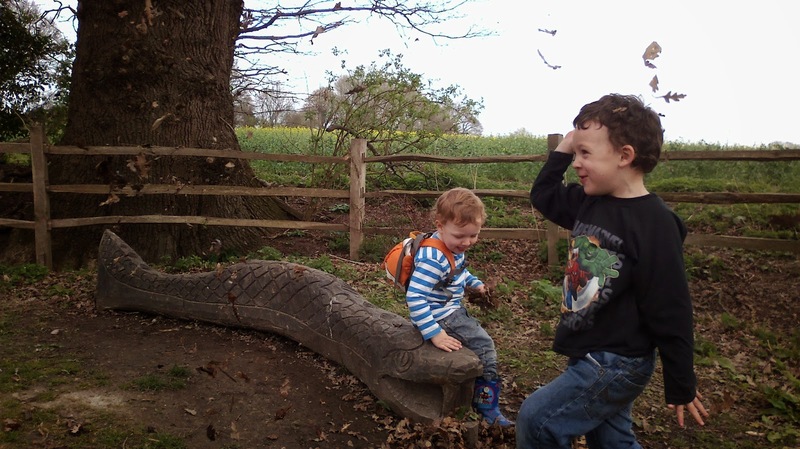 Talking about what we could see, hear and smell as we walked along was an excellent way to build the boys vocabularies. A pile of leaves in a ditch provided a lot of entertainment, moving them around, throwing them up in the air and 'feeding' the fish sculpture. We fed ducks and watched huge carp fish in the moat, then climbed all over the amazing castle, up winding stair cases testing our bravery and building muscles in little legs. 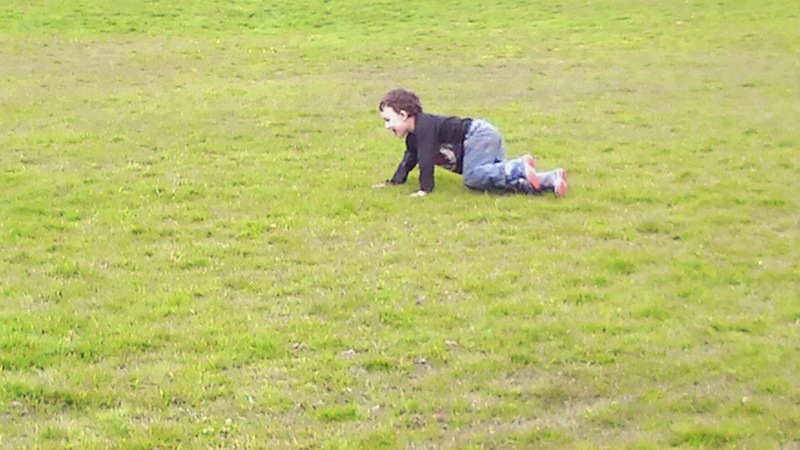 Finally, on the way back to the car park Ollie made groups of old ladies laugh as he crawled along with a strange jerky movement while shouting out that he was being a chameleon and was camouflaged against the grass so we couldn't see him. Toby's legs had given out by this point so he was having a nice carry from Matt and pulling faces at us. There is a great deal to be learned about the world around us, the history and the nature, from books and TV documentaries, but for any age there is no richer experience than getting out into historic sites and drinking it all in. It's worth repeated visits to the same site too, because both the National Trust and English Heritage frequently add in new interpretation resources and provide special events and volunteers to describe or reenact elements of history. One of the boys favourites experiences at Bodium was last summer when they made medieaval beer bread and saw the trebuchet launching projectiles into the moat. Don't be put off from visiting with small children and even babies, there has been a real improvement in recent years in trying to make sites more family friendly. All in all I highly recommend a visit to your nearest historic site, just stay away from the cream teas because they're all mine!